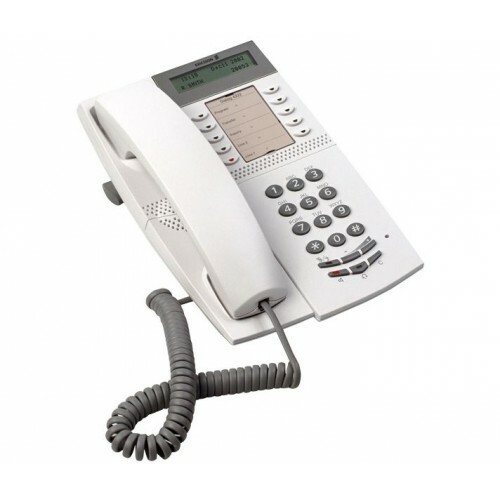 The Aastra Dialog 4222 light grey digital phone is a fully functional desktop telephone for office use with MD110 phone systems, as well as Aastra and Ericsson Businessphone phone systems. The Dialog 4222 has all the standard features necessary to facilitate the communications needs in a busy executive environment, as well as other functions such as hands-free speaking and an integrated headset port, though it is not headset compatible. You can attach a Plantronics or GN Netcom headset to the Dialog 4222, though you need a Plantronics M12 Amplifier or GN Netcom 8000 Amplifier respectively, for it to work with the phone. Why should you buy the light grey Aastra Dialog 4222? Besides the appealing light grey colour and ease of use, the Dialog 4222 features a two-line graphic display, hands-free function, hearing aid compatibility, programmable function keys, ringer, tone character, and loudness, 10 function keys with LED, an adjustable foot console, an optional unit-port for external devices, and a key panel port for connecting an extra 17- LED key panel. Finally found a phone thats hearing aid compatable.